Early Morning Smokers Are More Addicted And At Greater Risk Of Cancer : Shots - Health News To measure addiction, cancer researchers can count how many cigarettes are smoked per day and how many years someone's been smoking. Now, researchers are interested in when people have their first cigarette — the earlier in the day, it seems, the greater the health risk. 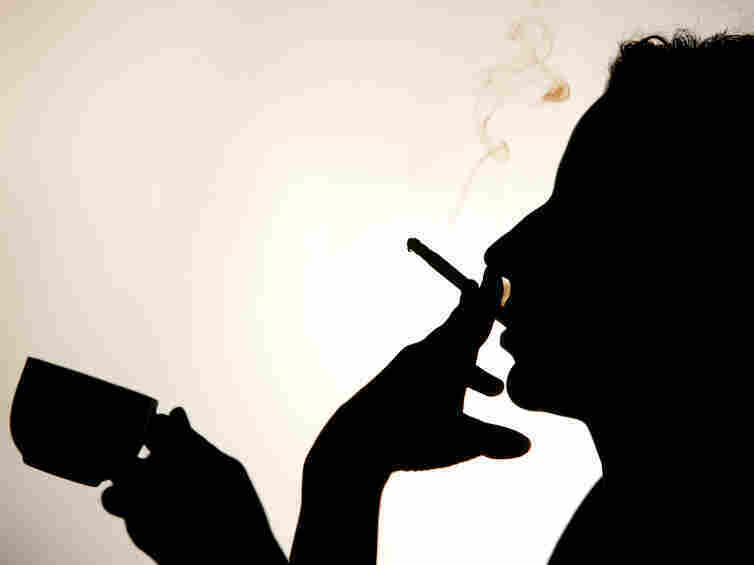 Early morning cigarettes are a proxy for the level of addiction, researchers say. Even though rising cigarette prices and new restrictions on smoking in public places have helped to make a dent in smoking rates in the U.S., there are still plenty of heavily addicted smokers out there who remain at great risk of developing cancer from their habit. Cancer researchers have learned something about which smokers are more at risk of cancer from measuring things like how many cigarettes they smoke per day and how many years they've been smoking. Now, researchers at Penn State College of Medicine in Hershey are offering more details on a third variable: the timing of that first cigarette of the day. In two studies published today online in the journal Cancer, Joshua Muscat and colleagues found that smokers who have their first cigarette 30 to 60 minutes after waking up have a small increase in their chances of getting cancer than people who wait longer. In one study of 4,775 smokers with lung cancer and 2,835 smokers without it, they found that people who smoked within 30 minutes of waking were 1.79 times as likely to develop lung cancer than people who waited at least an hour for their first smoke. Those who puffed between 30 and 60 minutes of waking a 1.31 higher change of getting lung cancer. This was after controlling for number of cigarettes smoked and other factors. In a separate study of a similar design, they found a link between 1,055 cases of smokers with neck and head cancers and a control of 795 people. Again, people who smoked within the first hour of their day were a little bit more likely to get cancer. "What's interesting is that the studies show that if people are more addicted then they're at a greater risk of cancer, but that relationship is independent of how much people smoke," John Richie, a professor of public health sciences and pharmacology at Penn State and a study author, tells Shots. "Addiction is still not very well understood, and some smokers are clearly at much greater risk of cancer than others simply based on their addiction." Michael Fiore, director of the University of Wisconsin Center for Tobacco Research and Intervention, tells Shots the findings seem logical. "In essence when you have the first cigarette of the day is a surrogate for how addicted a person is," says Fiore. "A lot of heavily addicted smokers overnight go into withdrawal. By the time they wake up, their blood nicotine level has fallen substantially, and their neuroreceptors are screaming, 'You gotta feed me.'" Richie and his colleagues say that their findings may help direct quitting programs towards the most addicted who are at the greatest risk. But first, he says, they need to know more about their smoking behaviors. "Do they inhale more deeply or take more puffs per cigarette?" These are things that can vary a lot smoker to smoker.